Operators: Elanchuk V., Maksimov L.
Describes held in February-March 1986 27 Congress of the CPSU. The meeting room XXVII Congress of the CPSU. 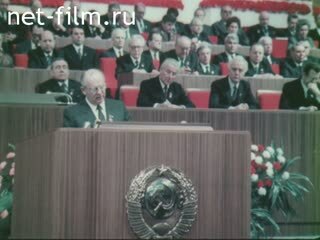 The presidium of the Congress: Andrei Gromyko, MS Solomentsev, Eduard A. Shevardnadze, EK Ligachev, Boris N. Yeltsin, Boris N. Ponomarev, VV Kuznetsov and others. Speakers: Mikhail Gorbachev, Ryzhkov, NI Tereshchenko, N. Gellert, B. Aleshnikov, VN Pletnev, K. Petrov, VI Isakov, V. Jaruzelski ( Poland), Castro (Cuba), J. E Dos Santos (Angola), Gus Hall (USA). 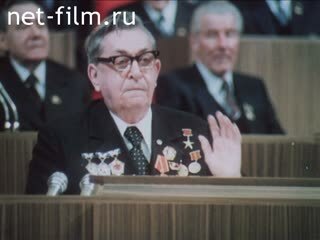 The film shows the work achievements in the Soviet economy, confined to the XXVII Congress of the CPSU. Construction of the Baikal-Amur Railway. Opening of the Metro in Novosibirsk. Handling cars in the new plane "Ruslan AN-124". Descent icebreaker "Russia" the stocks of the Leningrad shipyard. Meeting at RostSelMash "on the occasion of the opening of the assembly shop of the tractor factory. Economy of the farm for the 25 th Congress of the CPSU. Building cars in the Volga automobile plant in Togliatti. Harvesting of fodder, fodder production plant, irrigation installation, manor farm "Path to Communism" in the Stavropol Territory. Harvesting grain in the fields of Kazakhstan. Assembling tractors in the Leningrad Kirov Plant. A. Meeting of U.S. President Ronald Reagan and Mikhail S. Gorbachev in Geneva (1985). Ryzhkov at a meeting of the Council for Mutual Economic Assistance. Delegates vote for adoption of documents XVII Congress of the CPSU. Monument VI Lenin - LS. VI Lenin stands on Red Square. The people in the Red Square. The Kremlin, Moscow - LS. (With a / t). The chimes of the Spassky Tower (10 hours) - CU. Opening of the XXVII Congress of the CPSU, members of the Bureau are: MS Gorbachev, AA Gromyko, NI Ryzhkov and others, delegates applauded standing - different. With political report is the general secretary of the CPSU Central Committee Mikhail Gorbachev (synchronous) - Various. The congress delegates listen - different. Framing plans: plant steel plant, pouring steel, steel workers at work, a meeting, a person working - CU. ; Laying rails at BAM, show a symbolic key. The new village at BAM - LS., PNRM. (The plane). Lift-off, the earth from space. Opening of Metro in Novosibirsk station - CU. ; Show symbolic key - CU., PNRM. ; Station - LS. (With motion). Loading machines in the plane "Ruslan An-124» - LS. Mechanic and a pilot - CU. The aircraft flies - LS., PNRM. Icebreaker "Russia" before the first flight at the dock port of Murmansk (night) - LS., MS., PNRM. Sailor on the phone - LS., PNRM. A block of ice - CU. Flag Icebreaker - CU., PNRM. (Night). Shop factory "Rostselmash» - LS. The workers at work - CU. The meeting at the factory, the launch 100 combines "Don-1500" to the 27th Congress of the CPSU - LS., PNRM. ; Workers show a symbolic key - LS. It takes a column combines plant "Rostselmash» - LS. Construction of the pipeline in the Tyumen region - LS., Departure. Cleaning the highway: there are snow plows - MS., LS. Installation of large blocks of the compressor station with a bulldozer - MS., PNRM. Drillers at work - CU., PNRM. The helicopter carries the weight - LS., MS.
Workers secure the torso - MS., PNRM. The driver of the cab - CU., PNRM. Harvesting potatoes (Mechanized) - LS., CU. Sorting eggs at the poultry farm - CU., LS. Chickens - LS., CU., PNRM. Yuzhnachay, Lithuanian SSR) - LS., MS., PNRM. Dining kindergarten - LS. ; Small children eat - CU. Interior of a public building - LS., PNRM. Indoor pool - LS., PNRM. Mansion (with a / t). The journalists of the TV, watching presentation MS Gorbachev - different. Stand with the press materials - CU., PNRM. International newspapers - CU., PNRM. Framing plans: submarine submerged in the water, a hand on the remote control, the rocket takes off from the water, and people in masks. Antiwar rally - MS., CU. ATV goes - CU., Departure. Is the American military machine - LS., Departure. Military planes take off into the air - MS., LS. Faces of the soldiers - CU. Pass the participants in the World Youth Festival in Moscow - MS.
Luzhniki Stadium during the festival - LS. (With a / t). Meeting MS Gorbachev and U.S. President Ronald Reagan in Geneva: hello (on the street), walk up the stairs, talking in a room - different. The hand on the control panel - CU. Animation: War in Space - MS.
Flags of countries - CMEA - CU., PNRM. Meeting of representatives of the CMEA - LS., PNRM. Soviet Prime Minister Nikolai Ryzhkov signed a comprehensive program of scientific and technological development - MS. The meeting participants applauded - LS. U.S. military helicopters over sea and land - CU., LS., Hitting. Soldiers pass a gun charge - MS.
Are the "contras" - different. U.S. military adviser is speaking into the microphone - MS., CU. The soldiers get out of the shelter - MS. Pass tanks - LS., PNRM. ; War machine - MS. Soldiers run, fall, take aim - LS., CU. South African aggression in Angola trucks go, stop, and jump out of them fleeing soldiers - LS., PNRM. ; Shoot - LS., MS. Participants held a demonstration against the aggression in the African country - LS. A meeting of solidarity with the struggling peoples of Africa in University. Patrice Lumumba (Moscow) present applauded - MS., CU., PNRM. A man buys a newspaper at a kiosk - CU., PNRM. Delegates XXVII Congress of the CPSU in the sidelines of the congress - different. Foreign visitors to the sidelines - LS., CU. Shop car factory in Togliatti - LS., PNRM. Workers on the assembly of the car - different. New car models - LS., PNRM. Specialists in the factory yard at cars - LS., PNRM. General manager of V. Isakov inspecting machines - CU. XXVII Congress of the CPSU on the act V. Isakov, chairman of the kolkhoz "Path to Communism" ND Tereschenko, tractor from Kazakhstan, member of the Supreme Soviet of the USSR Natalya Gellert, W. Turner Aleshnikov, Hero of Socialist Labor, a weaver from Kostroma V. Pletnev, a veteran party miner first five KG Petrov (synchronously). Listen to the Hall - Various. Reaping grass strewed forage - MS. Processing hay silage on the farm "Path to Communism» - LS. ND Tereshchenko greet on the field with machine operators - MS. Working in the field of plant watering - LS., Departure. Collective farm homestead - LS. (The plane). Harvesting the Kazakhstan virgin - LS. (The plane). Harvester in the field - CU. Work on elevator, spilling grain - CU. Assembling tractors "K-701" at the Kirov plant in Leningrad - different. Drove tractor ready - LS. B. Aleshnikov at work - CU., PNRM. V. Pletnev, Hero of Socialist Labor, the work on the Flax Factory in Kostroma, speaks to the weavers, etc. - are different. 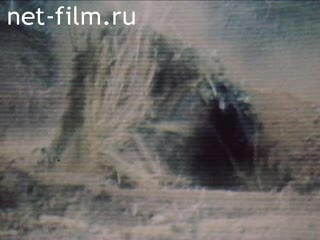 A. Stakhanov Donetsk miner at work. Rolls coal, the coal conveyor. Miners welcome Alexander Stakhanov, exceeding the norm. Jubilee change after record Stakhanov: miners at work, coal combine (mine "Kochegarka») - MS., CU. Musician playing trumpet - CU., PNRM. Girls presented flowers and the miners' hospitality »- LS., PNRM. Veterans congratulate miners - MS., CU., PNRM. Pioneers presented flowers to veterans - LS., MS., PNRM. Go to veterans with flowers - MS., PNRM. Dedication to the workmen on the young worker wearing a hard hat, veterans congratulate the young workers - different., Persons younger workers - CU. Pass the young workers with slogans - LS., Hitting. Hall of the Palace of Congresses during the XXVII Congress of the CPSU - LS., Departure. Bust VI Lenin on the stage - LS. The delegates rose and applauded - MS. Advocates elected General Secretary of the CPSU Mikhail Gorbachev (synchronously). Framing plans: those steel makers and other workers, factory shop, is the first train, waving children. Flying over the Kremlin - LS.